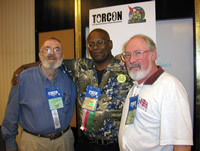 Chris Barkley gets together with Derek Nelson and Joe "Beak" Taylor, veterans of earlier Torcons. Karin Lowachee and Nalo Hopkinson listen attentively to Cory Doctorow. 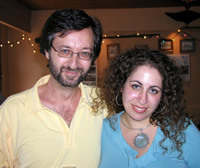 Guy Gavriel Kay with Deborah Meghnagi who runs his Bright Weavings web site. 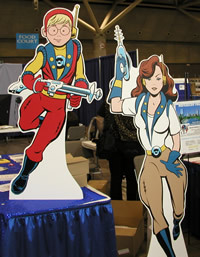 Noreascon 4's Space Patrol mascots protect their sales table. The fan photo gallery - full of famous faces. Mike Walsh is delighted at how empty his table has become. 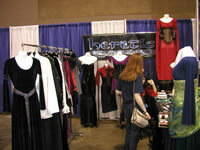 The dealers' room - lots of white space. 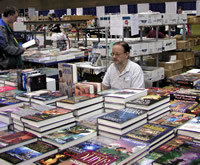 Larry Smith is safe behind his ramparts of books. 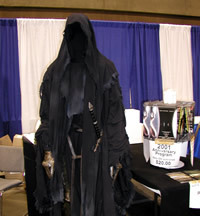 You will meet a tall, dark stranger in the Torcon 3 dealers' room. Lots of lovely dresses, all for people about half my size <sigh>. Holgrams - a very sfnal product.